Máncora is a town and beach resort in the Piura Region, in northwestern Peru. It is located in the Talara Province and is capital of the Máncora District. The town has something like 9,000 inhabitants. 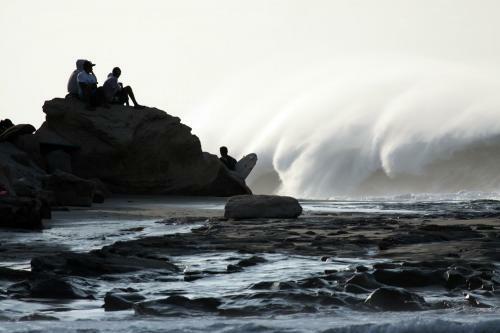 The area is known for its attractive turquoise beaches and good waves, making it a surfing destination. The beach town has over 30 different beach resorts that receive tourists from all over South America. It boasts a large porportion of luxury restaurants and nightclubs for such a small town of 10,000. Resorts rim the nearby kilometers of beaches connected by a road. The best months to visit Mancora are May-November. There are several hotels to choose from in Mancora. This beach location is favored by two ocean currents year round: the cold Humboldt Current 14 to 19°C and the warm Niño Current 21 to 27°C, giving it a tropical-dry climate with ocean waters averaging around 24°C. Summers last from December to April and are very hot. Rain is usual during the night and the temperature can reach over 38 °C. The rest of the year is dry, breezy, and sunny. The temperature during winter and spring never falls bellow 25°C during daytime and is usually around the high 20's. Night temperatures drop to around 17°C. The big sandy beach offers plenty of space for save launching and landing. The bussiest months on the beach are during the last two months of the year, and January. But even when it's bussy in these months the beach is never really crowded because of the huge space. This beach location is favored by two ocean currents year round: the cold Humboldt Current 14 to 19°C and the warm Niño Current 21 to 27°C, giving it a tropical-dry climate with ocean waters averaging around 24°C. The beautifull water is clean. 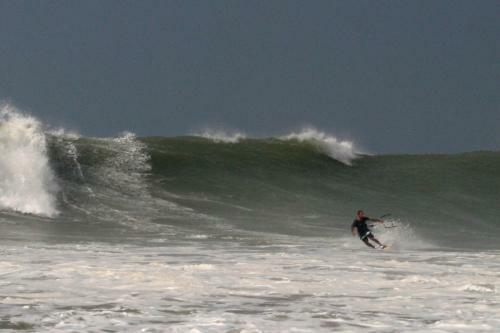 Mancora is a good wave spot. Look out for fisher nets and wave breakers. At low tide some rocks can be exposed, so watch you fins. Because of the water temperature is shorty is recommended. The thermal consistent wind mainly blows in the afternoon from the southwest and is side-onshore. The wind blows 3-4 days out of a week. 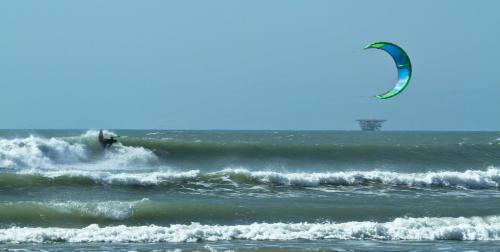 There is a kitesurfschool on the spot. Toilets, gear rental and food are available. There is even a kitesurfshop. Talk to the locals or kitesurfschools for options. The nearest airport is Piura, Talara. The nearest big city is Tumbes, Piura. 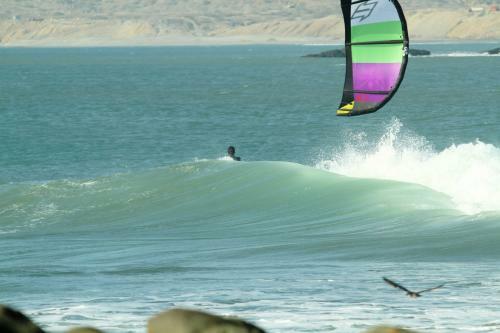 You can also fly to Guayaquil, Ecuador and take a 6 hour bus ride directly to Mancora. Getting transportation from any of the airports is easy. Peruvian bus travel is comfortable, dependable, frequent, and safe. The advantages of taking buses (aside from lower prices) is that the buses will drop you directly in central Máncora.